Can someone explain how SI vst’s handle .prog and SFZ files? I see where most patches are prog files but there’s also a folder with SFZ and wav files. Thanks. For the Bass Guitar I can delete the entire SFZ file folder and still load the patches it refers to, so it seems they have no bearing on it whatsoever. A while back a member posted he had changed an SI-Drum Kit PROG file to point to a different SFZ file using Note Pad and it worked for him. But when I make a similar change to an SI-Bass PROG file and try to load it I get an ERROR message. WRT the relationship between samples and sfz files, all sfz engine synths work in a similar way starting with a hierarchy of samples referenced in sfz files at the base. Prog files are at the top of the hierarchy containing global settings and references to other objects in the hierarchy which may include samples and sfz files. The SI synths were not intended to be user extensible or modifiable. DPro, Rapture and Session Drummer are. That said, it is possible to create new sfz files using the same names as the the ones referenced in the prog files and the prog files will pick up the new sfz files. It is also possible to add new samples with the same names as the ones in the sf files and the sfz files will load them. Sfz files can override the default sample path location too. I would not recommend trying to edit the prog files. They are binary files and each synth uses a different format. So the SI synth is recreating the files from the registry if I don't?? Otherwise how could the registry point to and load files that don't exist? The SI synths were not intended to be user extensible or modifiable. DPro, Rapture and Session Drummer are. This is true, excepting the prog files, thus the original question. That said, it is possible to create new sfz files using the same names as the ones referenced in the prog files and the prog files will pick up the new sfz files. It is also possible to add new samples with the same names as the ones in the sf files and the sfz files will load them. Tried & failed. A registry edit shouldn't be necessary here since no names have been changed. Unless it's possible the sample size is locked in so that changing the samples renders an error. Sfz files can override the default sample path location too. Tried & failed. Is a registry edit needed for this one? I would not recommend trying to edit the prog files. They are binary files and each synth uses a different format. So I wonder how the poster mentioned above could do it when I can't, unless Windows 10 changed how Note Pad works. Note Pad options to save are: ANSI, Unicode, Unicode big endian, & UTF-8. All 4 fail to reproduce the prog files. All the sfz engine synths (including SI Suite) use the "Multisamples Folder" to look up sample and sfz files that have relative paths in the .prog files. There is another registry entry which should contain the same "Multisamples Folder" path in HKEY_LOCAL_MACHINE\SOFTWARE\WOW6432Node\Cakewalk Music Software\Studio Instruments\Bass. Not sure what happens if the 32bit and 64bit entries are not the same. But I do know if the "Multisamples" folder is missing when the synth is added to a project, it will throw errors. 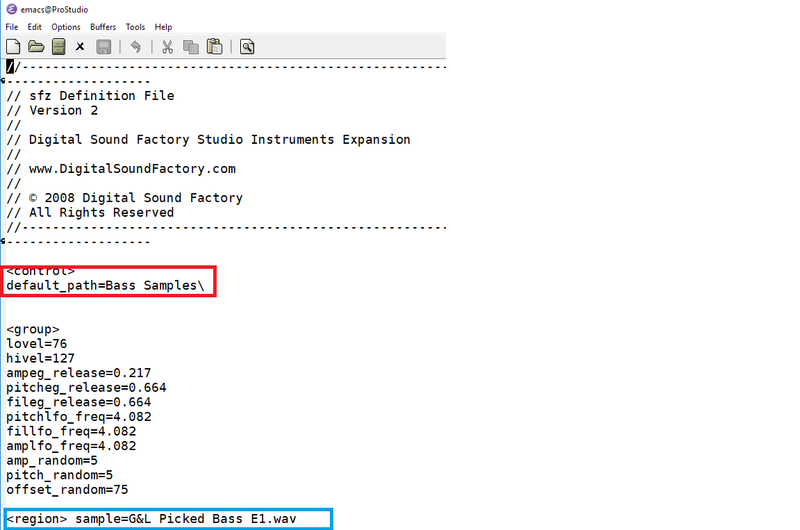 If the "Multisamples" folder is removed after the synth is added, it will error the next time the project is loaded or when a new program tries to load a sample or sfz file. The synth will not create missing files on the fly. If files are missing, the synth will error. There is minimal program file management in the SI Suite. The SI interfaces do not provide a way to add/modify samples or sfz files used by the programs but it is possible to save changes to the controls on the UI. where sfz files look for samples with absolute paths. WRT hacking prog files, if the user actually used Notepad (note that is not what he says but claims Notepad would work), he was lucky. Using a text editor to change binary files is risky. Even making direct edits to binary files with a hex editor can produce unexpected results. Hacking binary files is not a user level activity. With all that said, keep in mind the original intent of the SI plug-ins. They are simple sfz engine synths designed to work with factory supplied content and the ability to save changes to the UI controls as new presets. There is no facility for adding samples or creating new programs based on different samples or sfz files. Thanks scook for all your input. I'm not really interested in hacking it, just hopeful of using different samples. When I change an sfz file to reference another folder and sample file, it still plays the original sample. It is doable at the cost of the existing samples. First, it is to figure out which sfz files are used by the program. Notepad can work in this case although to be safe DO NOT SAVE the prog files after looking at them. Notice there is a fully qualified sfz file. I cannot say for sure if the path is completely ignored or the sfz search algorithm falls back to the default. My guess is the old path is ignored. Either way, in my PC the prog ultimately loads Velocity Picked.sfz from the default location. The Velocity Picked.sfz is interesting because it makes use of the default_path opcode (red box in image below). If this is changed to an absolute path, the samples may be located anywhere. If that opcode was not used, providing fully qualified names for each sample (blue box in image below) is the other way to have samples in a non-default location. Because both the red box and blue box use currently use relative paths, these entries are appended to "\Multisamples\" after the path in the "Nultisamples Folder" in the registry. Note: any changes to samples or sfz files should be made before loading the synth or at least the program. All Cakewalk sfz engine synths read samples and sfz into memory when the program is located. It works!!! ... and it IS as easy as it can be. My troubles were all because I was working in 32 bit Sonar. I installed 32 and 64 bit versions of SI and each one has it's own Multisamples folder. However, there's only one set of PROG files in the ProgramData folder and they only refer to "Program Files" not "Program Files(x86)", so no matter how I changed the sfz files or samples in 32 bit SI, nothing was going to change... Makes sense if the PROG files were all written before 64 bit OS's were in wide use. I should delete the 32 bit data folders as they are not used by either version. Better yet, keep them as original backups when editing the 64 bit files. Sorry to drag you thru this scook. The UP side is if I had been working in 64 bit Sonar I would have never learned this. Now on to some fun. The SI Bass poly "slide" feature is a natural for pedal steel bends and would alleviate having to have multiple midi tracks for varying pitch values. Giving up one of the 10 bass styles is a small price to pay. That is why I mentioned the 32bit registry after realizing the 64bit location did not seem to work in this case. Normally the 32bit and 64bit entries have the same data (so only 1 set of multisamples is installed) but it seems they got out of sync. Since you continue to work in 32bit software keep mindful of the 32bit sections of the registry. This is bound to come up again.